Paris: French investigators probing the devastating blaze at Notre-Dame Cathedral questioned workers who were renovating the monument on Tuesday as hundreds of millions of euros were pledged to restore the historic masterpiece. Junior interior minister Laurent Nunez told reporters at the scene that work to secure the structure would take place into Thursday which would enable firefighters to go inside to remove any remaining artefacts and artworks. The Paris fire service announced that the last remnants of the blaze were extinguished on Tuesday 15 hours after the fire broke out. Ongoing renovation work on the steeple, where workers were replacing its lead covering, is widely suspected to have caused the inferno after the blaze broke out in an area under scaffolding. Investigators interviewed witnesses over-night and began speaking to the employees of five different construction companies which were working on the monument, said public prosecutor Remy Heitz. The privately run French Heritage Foundation launched a call for donations on its website — www.foundation-patrimoine.org — and several pages were also set up on the Leetchi fundraising portal. 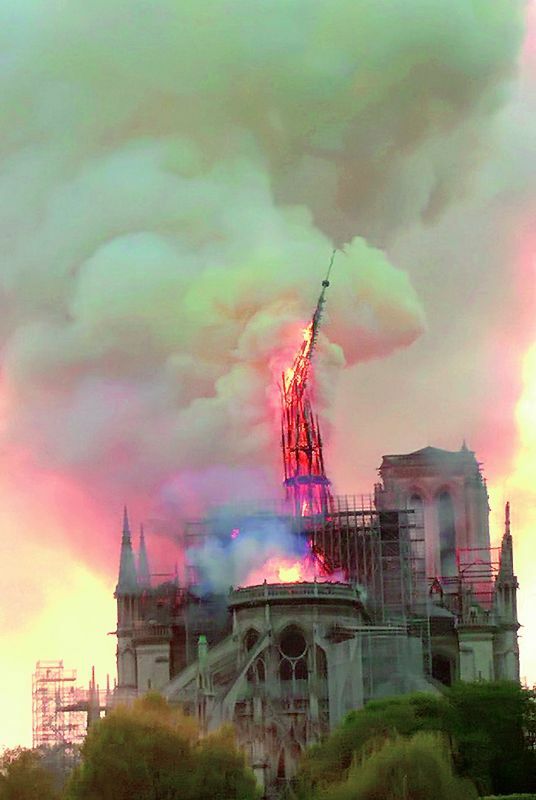 “We have everything to be able to rebuild it in exactly the same way,” culture minister Franck Riester told France Inter, adding that the government was looking at ways to encourage donations for the cathedral. Many more travelled on Tuesday to the banks of the river Seine to gaze up at where the roof and steeple once stood. The Holy Crown of Thorns, believed to have been worn by Jesus at his crucifixion, was saved by firefighters, as was a sacred tunic worn by 13th-century French king Louis IX. Rescuers formed a human chain at the site of the disaster on Monday night to bring out as many artefacts as possible which have been stocked temporarily at the Paris town hall. The sense of shock was palpable in France and stirred reactions from governments across the world. The chief architect of Cologne cathedral said it could take decades to repair the damage caused to the Notre Dame cathedral by a massive fire. Victor Hugo’s The Hunchback of Notre-Dame shot to the top of the Amazon bestseller list. The original French version of the gothic novel, Notre-Dame de Paris, became the fastest selling book in France and is also a number one bestseller worldwide in English. Its iconic twin bell towers remained visibly intact. Paris officials said the world famous 18th century organ that boasts 8,000 pipes also appeared to have survived. Culture minister Franck Riester said that other works are being transferred from a storeroom in City Hall to the Louvre on Tuesday and Wednesday. Distraught Parisians and stunned tourists stood along the banks of the Seine River, joined together in a solemn rendition of Hail Mary and Ave Maria. Others knelt and prayed. During the French Revolution, revolutionaries tore down 28 statues of kings in Notre Dame.